Metal detecting is a serious hobby for many people in all areas of the world. From those who like to stroll along the beach just to see what they may find to those who venture out on a sort of treasure hunt. Having the correct detector can mean the difference between coming home empty handed or finishing your day with a bountiful of great value. 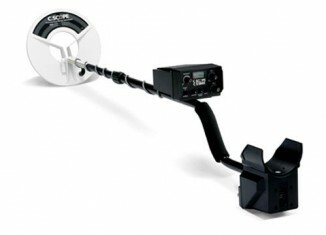 Let’s take a look at the C. SCOPECS1220R metal detector and review the important elements of this particular make and model to see if this may be the one for you and your particular needs. Some of the elements that you may wish to consider when looking for a metal detector are how often you wish to venture out, where you wish to go, the possible weather conditions that may occur while you are outside and the sensitivity at which you feel you need for detection. Being comfortable while you search is also an important element. If you are to spend hours hunting, you will want a model which features that caters to the operator’s comfort. Lastly, while finding treasure does require a certain amount of skill, the device that you use will play an important role in your success. 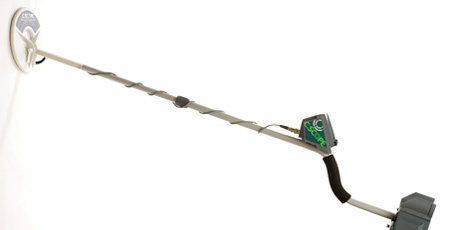 The C.SCOPE CS1220R metal detector, manufactured by C.Scope known as being the world’s favorite metal detector is a highly adaptable specialized style metal detector. Fairly easy to use, most search in ground mode which allows for maximum depth. When you come upon a good signal, you can then switch to discriminate mode which allows you to analyze that particular signal. It allows for manual control and has rather good audio discrimination. Discrimination is an important element of detecting since the signal received from any metal object emits its own characteristic phase shift. This model is able to distinguish between an aluminum pull tab and a coin. The operator can set the C.SCOPE CS1220R metal detector to remain quite if it reads the simple pull tab but to set off an alert for a denser object such as a coin. However, one must keep in mind that if set too low to ignore a pull tab, jewelry may be passed over as well. With the CS1220R, you can set this to give you high pitches for good targets and low pitches for objects you would not be interested in. 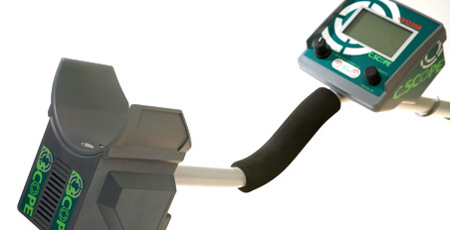 The operating System for the C.SCOPE CS1220R metal detector is a Non-Motion 17kHz. This runs on eight AA 1.5 volt batteries. The search head of this piece of equipment is a 20cm ISOCON head. You don’t have to keep the search-head ‘in motion which is a fine feature indeed. You can use the detector in undergrowth and bring the search-head to a stop over the area where you just barely make out a signal. Then you can switch in the target analysis side of the detector and decide whether you wish to dig or not. Rated rather well in sensitivity, this has twin channel ground discriminate modes. Fairly light at 1.7 kg, this model is easy to transport and a rather good weight to hold and handle. 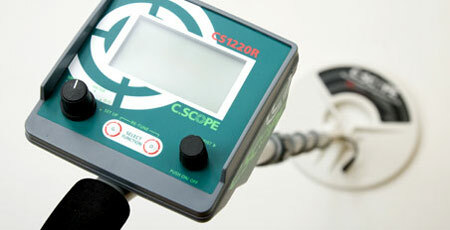 The C.SCOPE CS1220R metal detector has some quality features. There is a super easy on/off switch, an LCD target Id and signal strength and a wide spectrum audio discrimination. For those who are seeking comfort as an important feature, this model has an adjustable stem length, which allows the users to adjust this to a length that feels just right. In addition, this feature allows for more than one user to be comfortable when using it. There is a counterbalance stem with an arm rest which really helps out for those who will be spending quite a bit of time with this detector and don’t want those arms to tire out. There is also a headphone socket, which can come in very handy. The C.SCOPE CS1220R metal detector is ideal for those who are serous treasure hunters and want a piece of equipment that they can rely on. Since predicting the weather is a bit like trying to predict which treasures you will find, the C.SCOPE CS1220R metal detector is perfect in all terrain and weather conditions.